A heatmap is a visual representation of how users browse through your website. Using VWO, you can create customized views to track activities of a specific visitor segment and save the view for quick viewing. For example, create a custom view to view clicks on a page for people who arrived via a specific country, device type, referring domain, or type of referrer. To create your Heatmap Views, go to Heatmaps under Analyze on the navigation menu. This will take you to the Heatmaps dashboard where you can enter page details to generate heatmaps. Next, click on Create View on the right panel of the dashboard. To set up the heatmap view, you can start by entering a title for it by clicking on the pencil icon against New View. 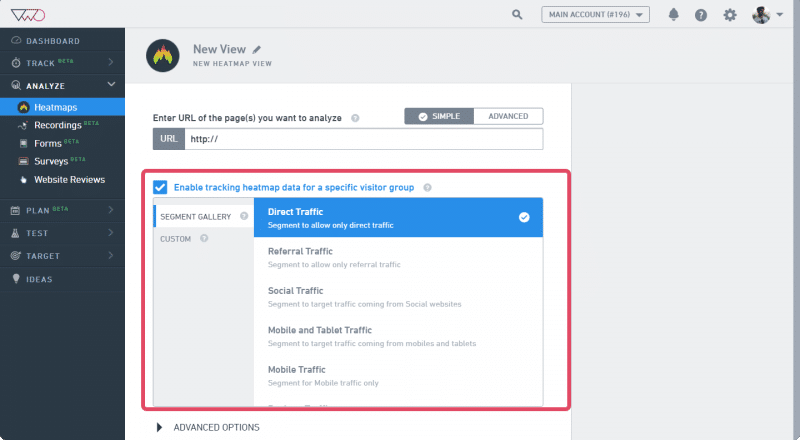 Then, enter the pages you want to include in the view and define the target audience you want to track. Specify the URL of the pages where you want to include in the heatmap view. You can use URL patterns and regular expressions to run tests site-wide and on multiple pages. PRO-TIP Click the Advanced tab next to the URL field to include or exclude URLs from the view. Using this tab, you can also define advanced pattern-matching options to include either a broad URL with wildcard entries or a specific URL. The advanced option allows you to schedule the heatmap to run, pause, or stop at specific times. To learn more about using the scheduling option, click here. Click Create to complete the setting up the heatmap view. Once you start the heatmap, it will run on all the URLs on your website that contains the VWO smart code. 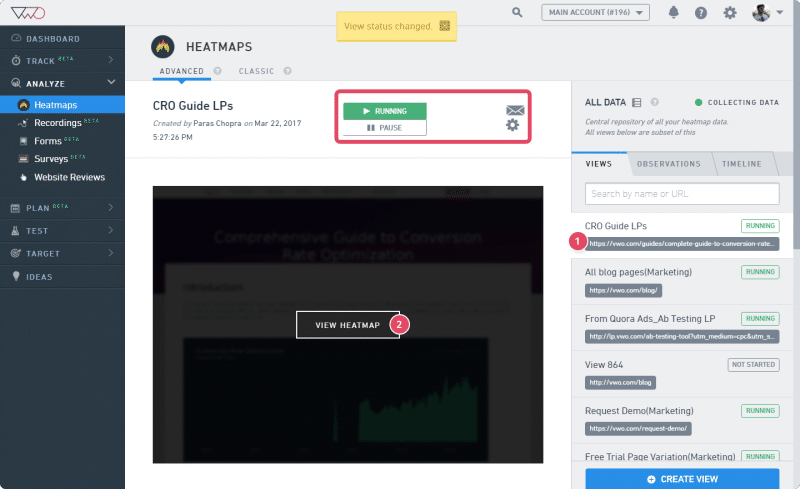 However, the view you have created is for specific pages and will allow you to quickly access heatmaps without the need to create a filtered report repeatedly. After the View is created, VWO displays a preview of the Heatmap link you have generated. Next time you want this heatmap, all you have to do is select the view from the Views panel on the right side of the dashboard and then click View Heatmap. To begin the test, click Start. To mail the heatmap report link to an email contact, click Email icon.